It was with some great irony that we stumbled upon this little gem because of a silly sign when a friend, who was supposed to be traveling with us, had originally planned on visiting the shop. We were surrounded by tourists, merely following the hoard headed to the lookout point for the best sunset views, when we chanced upon the store. It was a haven, as most walked past, barely noticing Atlantis. Atlantis Books is owned by two English men who spent a week in Santorini and noticed there were no bookshops there, so they decided to open one. The shop is located in Oia, the town you see in most photos of Santorini (a.k.a. the place where parts The Sisterhood of the Traveling Pants were filmed). Atlantis is a multilevel building, done up in bright white, with a very interesting interior. To some it may look haphazard, but to us it looked cozy. Floor to ceiling shelves line the walls, each one filled with books. In fact, almost all available surface is covered in books except for the chair where the cat sleeps. There’s also a loft behind the shelf, where a bed is available, for those who want to stay in Atlantis. 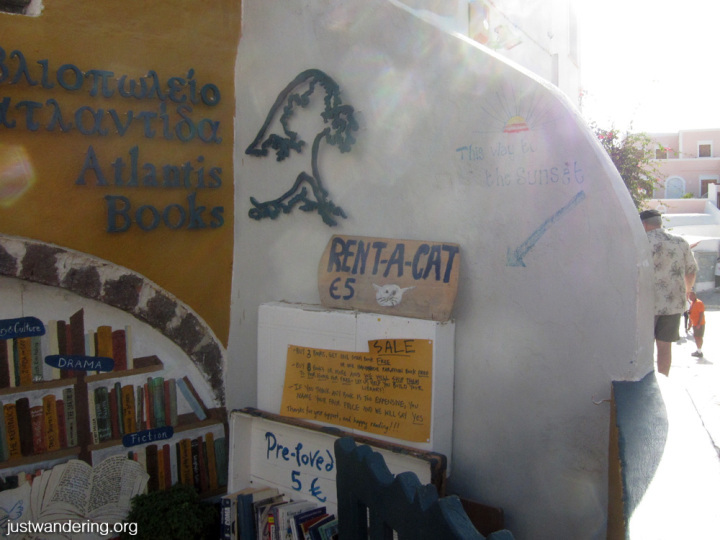 They have an excellent selection of English and Greek books, including first editions, but it’s not just the books and the cat that endears visitors to Atlantis. Guests can enjoy the gorgeous view of the caldera from their roof deck, listen to some great music, and chat with fellow book lovers. 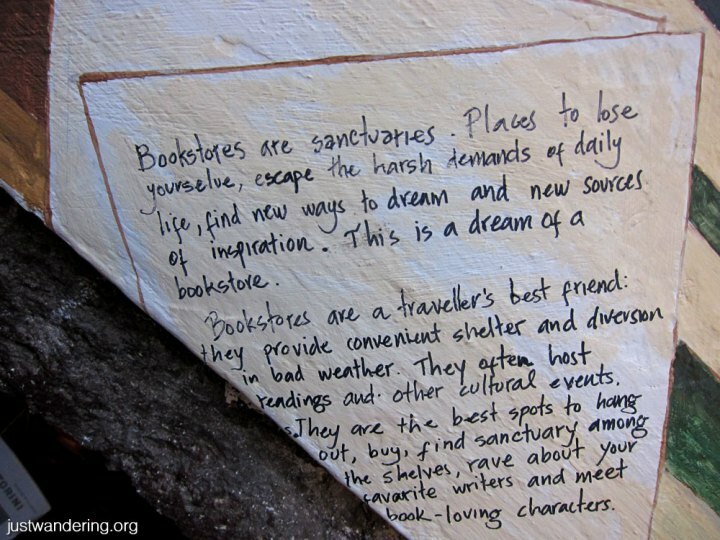 More than the merchandise, Atlantis Books is about the community.